Limoncello is a spirit of Italian origin that is made by steeping lemon peel in a neutral spirit long enough to extract the oils out of the lemon peel. The result is then mixed with some simple syrup and served as an after-dinner digestif. Clocking in at around 30% ABV, it's a sipping drink, but the bright lemony tartness gives it a more refreshing kick than your typical spirit. It's not my favorite thing, but it's definitely something worth trying after a hearty Italian meal. 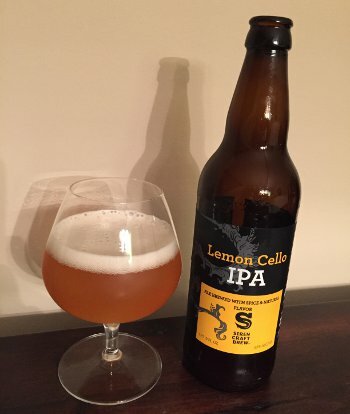 The idea for this beer was to create a much more drinkable version of a Limoncello. It's kinda like a beer/Limoncello hybrid, with the tart and refreshing nature of the spirit mixed with the quaffability of beer. This is accomplished by doing a quick sour mash, adding lemon peel and juice to the mixture, and then adding lactose to sweeten things up*. Finally, they add a bunch of Sorachi Ace and Citra hops to the mixture, each of which contributes additional citrus notes. Despite the hop additions, I feel like calling this an IPA is a bit misleading. It's got some nice aromas and the balancing bitterness is there, but the beer is otherwise dominated by its tart, lemony character. This was the intention, of course, so I'm not saying its a failure or anything, but it feels more like a wild ale than an IPA. This beer was a collaboration made at Siren brewing in the UK. I've never had any of Siren's beers before (they're a relatively new operation), but their collaborators are some of my favorites. Hill Farmstead is in the running for best brewery in the world, while Mikkeller certainly makes some of the best beer in the world, though occasionally he engages in flights of fancy and experimentation that don't always pan out. This beer seems like one of those flights of fancy, so how did they do? I don't really know. Beer Nerd Details: 9.1% ABV bottled (500 ml). Drank out of a snifter on 9/26/14. Vermont beer treasures are rapidly depleting at this point, though there's at least one remaining Hill Farmstead beer coming up, so stay tuned. * Most of the time lactose is reserved for Milk Stouts (the sweetness balancing out some of the bitter roasty character), but this marks the second time in just a few weeks that I've had a pale beer with lactose. Go figure. This page contains a single entry by Mark published on September 29, 2014 11:56 PM. Three Floyds Gumballhead was the previous entry in this blog. Various and Sundry is the next entry in this blog.